Congratulations to "Jennifer D.", the winner in Kat's giveaway. Thank you to all who participated. I’m the author of more than sixty novels, Historicals in the past, currently I write Romantic Suspense. My last book, Against the Wild took the number 8 spot on the New York Times bestseller list. I’m fortunate to live in beautiful Missoula Montana, but also have a home in sunny California where my husband and I spend our winters. Offices in both places make it easy to move back and forth and both places have beautiful views. I started in 1985, published my first novel in 1988. I was inspired to write mostly because I love to read. I tried writing because my husband was writing a book. In just a few weeks I realized I had found my true calling. Almost from the start I was writing suspense, though in the beginning the suspense was set in the past. Eventually I tried Contemporary Romantic Suspense and found I really loved writing that genre. I have no idea what they are. I fit most of the stereotypes. I’m a hermit, just as you would expect. I’d rather write than talk. Most people can’t earn a living as a writer, not a misconception, though some of us have been lucky in that regard. Are there any other genres you have written, and what inspired you to branch out to them? As I said, I’ve written a lot of Historical novels. I’ve also written in different time periods. Once I tried writing contemporary books, I felt the freedom and the challenge. I knew that was what I wanted to do. I’m finishing the edits for Against the Tide, which is the last book in my Brodies of Alaska trilogy. It’s high-action and plenty of suspense. After that, I’m continuing with the Brodies, but the publisher is tweaking the titles a little, changing to INTO instead of AGAINST, hoping to make it easier for readers to keep track. Into the Fury will be the first, Ethan Brodie, Nick Brodie’s cousin. The first books are set in Seattle. It’s just what I do. As I said, my calling, what makes me happy. I love the challenge. I love finishing a book. I love that readers are enjoying them. I’m judging for the Rita awards, which means I’m reading about 8 novels in various and sundry genres. Currently, I’m enjoying a paranormal Western called Gun Shy by Eleri Stone. Going to give the novel high marks. Probably the eighteen seventies…things were progressing, becoming more modern, but there was still a real sense of morality, loyalty, and family. I used to say I should have lived in the twenties because the clothes were so glamorous! I just met someone I admire. Ryan Zinke, newly elected Congressman from Montana, former commander of SEAL team six and first Navy SEAL ever elected to Congress. He was impressive. Be interesting to meet Bill Gates and his wife, or T. Boone Pickens, people who have contributed greatly to our country. No. I’m in fantasy land all the way. I probably use traits I see in real life people. A good writer needs to be a good psychologist and a good observer. Satellite cell phone. Then I wouldn’t be stranded very long! I love to travel. I like expensive hotels and gourmet meals. I also like camping. I don’t mind roughing it on ocassion. I like boats. We have a dock but no boat. That needs to change. When I get stuck. When I can’t figure a way to solve my hero or heroine’s dilemma. When I can’t think of a big enough dilemma. It’s kind of a semi-writers’ block. It’s more story block. Trying to figure out how to solve the plot problem. Once that happens, I’m rolling again. How long does it typically take for you to write a novel? Six months. I can do it faster, but I tell myself I really need some sort of life beyond writing. How many hours a day do you dedicate to your writing? I’m working all day. I promote in the morning, write all afternoon. Five to six p.m. it’s time for a glass of wine. And some personal reading time. On my bucket list is a Silverseas World Cruise. One hundred and ten days starting in Australia and visiting all the exotic countries I would otherwise never get to see. That’s my dream vacation, though I always up for a trip to France. If your novel, AGAINST THE SKY, was made into a movie, who would you cast as the hero? I think the guy in Hawaii Five-0, Alex O’Loughlin, would be great. Looks almost exactly like the hot guy on the cover and also the guy in my head. In America’s last wilderness, there are no limits to what a man can do. Samantha Hollis never thought she’d meet anyone like Nick, especially in a place like Las Vegas. But after one reckless, passionate night, she discovers the charismatic stranger is everything she wants in a man. But can he ever be anything more than a one-night stand? 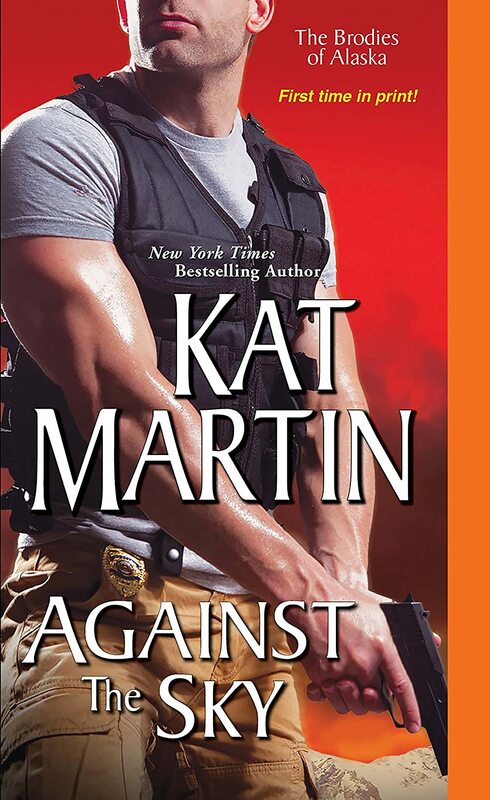 Kat will be giving away a copy of AGAINST THE SKY to one person leaving a comment or email entry. Giveaway ends 11:59pm EST February 18th. Please supply your email in the post. You may use spaces or full text for security. (ex. jsmith at gmail dot com) If you do not wish to supply your email, or have trouble posting, please email maureen@justromanticsuspense.com with a subject title of JRS GIVEAWAY to be entered in the current giveaway. I love this series. I have been following this series from the first book and I'm hook. I even love the new settle fro each of the trilogy in this series. It is like a series within a series but it is also a spinoff of a series. I'm putting too much thought into it. Thanks for the giveaway. Congratulations to Kat on the success of Against the Wild. It sounds like an exciting series. I'm looking forward to starting this series. Thanks for the interview! Jonetta-- Hope you enjoy the Alaska books. they are 3 of my favs. Glad you liked Gabe! He was a definite hunk. Couple of hunks in SKY, too. warmest, kat. Enjoyed reading the Q&A! Congrats on your book Kat! I agree. Alex O'Loughlin from Hawaii 5-O would be awesome if this was made into a movie. I put this book on my wishlist. Against the Sky sounds like a must read for me. I want to know how Nick and Samantha handle everything in Alaska. Love the series and the interview. Looking forward to reading AGAINST THE TIDE. That cruise sounds marvelous! As does this book. Wowee, going on my TBR for sure. Thanks for such a fun Q&A! I love Kat's books.Please enter me in the giveaway. congrats to Kat on her new release! Thanks for the fun interview! Fantastic interview!! And congratulations on the new book Kat! I love, love your books!! I can't wait to read this one. Thanks for the chance.